Lol again I love the expressions. Hermione is sticking her tongue out concentrating. That just cracks me up. I love it. Very cute. 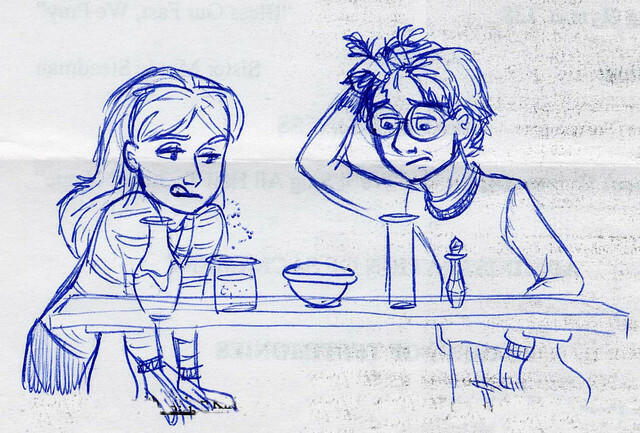 I like Hermione's expression; I do the same thing when I'm concentrating on something. ^^; Well done! this is great!!! harry looks so lost! wonderful expressions, that's my downfall but i4 give you no problems at all! good job!! what's happening with harry's legs? slip with the pen or is it abstract? Actually, what you might be looking at is the curved leg of the table (look at the leg in front of Hermione and you'll get a good idea of it). Half of Harry's left leg and arm are hidden behind the table and the table's leg. Think Hermione. Do what you do best! they look soo nervous. it captures the story well. Very characteristic of both Harry and Hermione. Harry looks cute when he's confused! Personally, I was mad that they left this part out of the movies. But there were seven potion bottles, weren't there? i see y harry is confused! i puzzled over this page for,like, 30 min. and still didnt get it!